India’s diabetes burden has more than doubled between 1990 and 2016, with the total number of cases going up from 26 million to 65 million. The death rate due to diabetes increased by 131 per cent, found a study published in Lancet Global Health. The prevalence of diabetes in adults above 20 years increased from 5.5 per cent in 1990 to 7.7 per cent in 2016, the paper found. 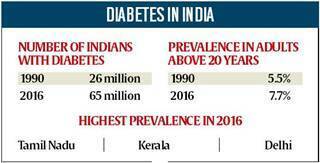 The disability-adjusted life years (DALY) rate for diabetes increased in India by 39.6 per cent — the highest increase among major non-communicable diseases. Other risk factors include tobacco use, occupational exposure to second-hand smoke, low physical activity and alcohol use. In 2010, India announced a National Programme for Prevention and Control of Cancer, Diabetes, Cardiovascular Diseases and Stroke, aimed at preventing diabetes through behaviour and lifestyle changes, early diagnosis and management, and increasing health system capacity. The programme did not take off, but the Lancet paper hoped that the outcomes for the NDA government’s Ayushman Bharat would make a dent in India’s diabetes trajectory.